Celebrate National Robotics Week with robots made from R60160 Constructa Clips, recyclable materials, R15298 Gizmo Paper and a lot of creativity! Learning Objectives: Use recyclable materials as a new medium for forming art projects. 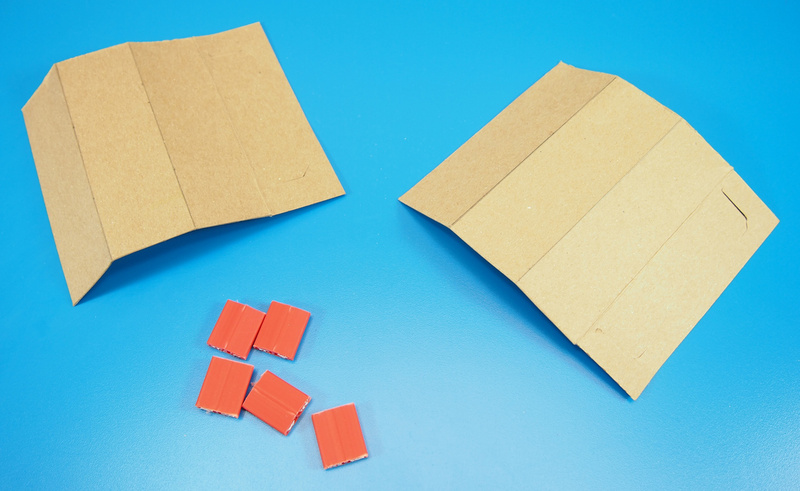 Form a 3D model out of basic cut 2D shapes. Develop fine motor skills through use of Constructa Clips. Learn names of geometric shapes such as triangular prism, cylinder or rectangular prism. Position Gizmo Paper in appropriate spots throughout. 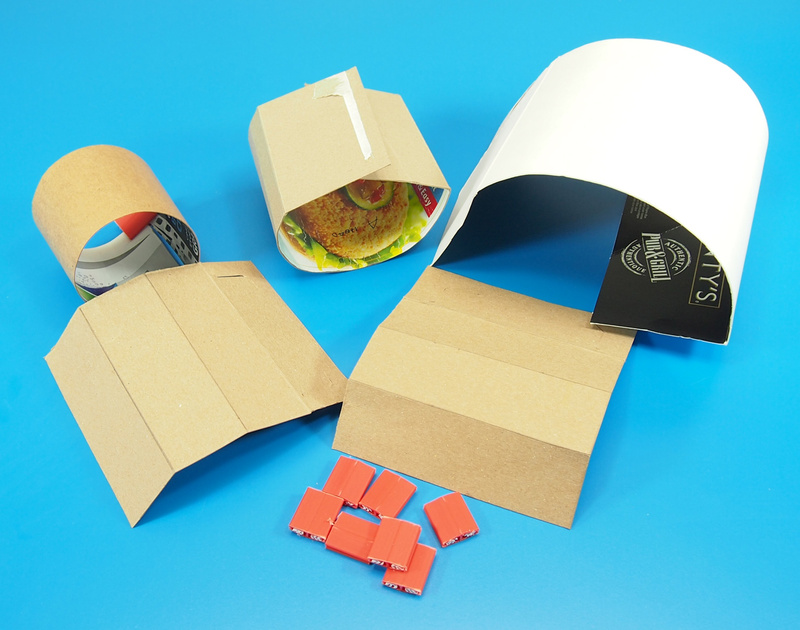 Prepare your set of materials using recyclable boxboard. 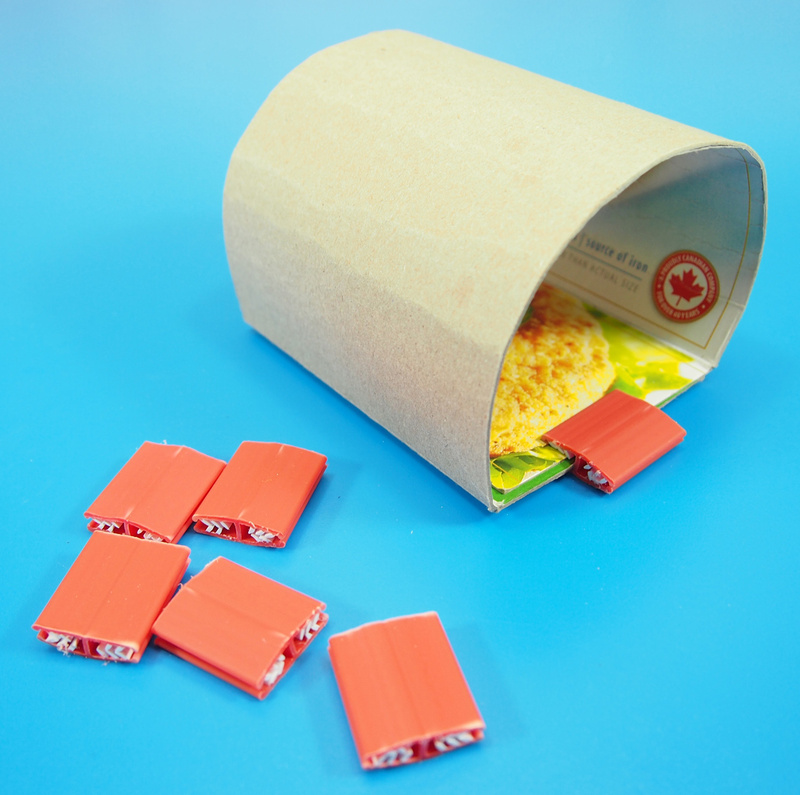 Make sure to let your students know a couple of weeks before this project that they should bring to the classroom any recyclable boxes they may get at home. 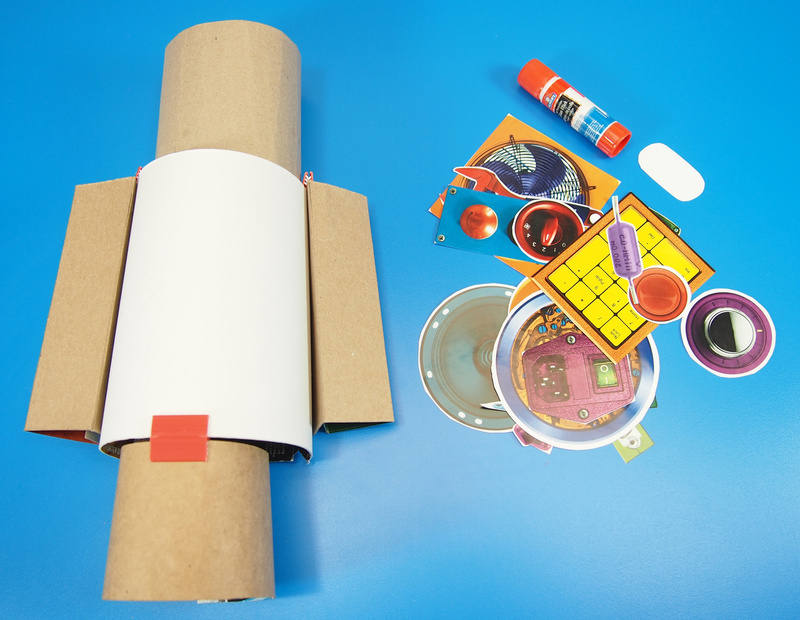 You can make virtually any shape or form of robot imaginable with a few basic tools. 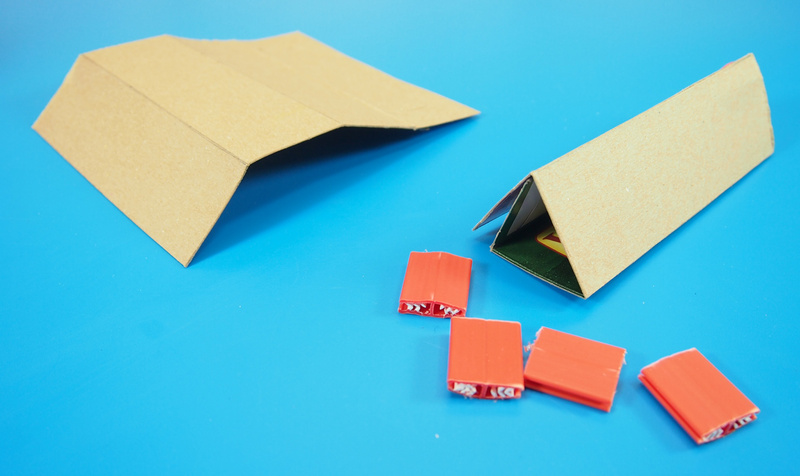 For the first part of the activity, provide all the materials to your students and ask them to choose two or three boxes to make their robot out of. Students can cut the box down into individual shapes or incorporate the main shapes into their designs. Give your students sheets of paper to sketch out their robots. Encourage them to pay attention to the different sizes and shapes of the boxes they chose. How can they incorporate the boxes into their robot designs? For inspiration, use the following tips! We’ll start off by making the body. I cut a big box along one edge so that it separated into one long rectangle. 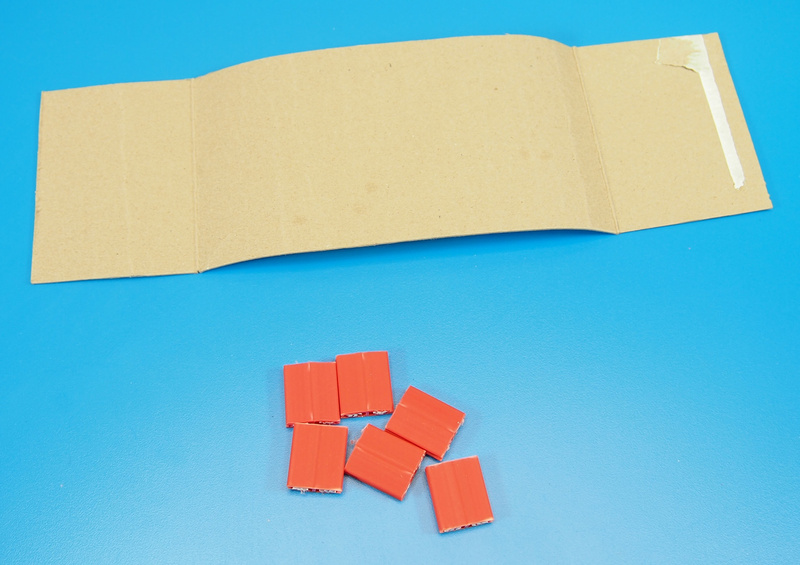 Roll the body into a cylinder and secure with a one-way Constructa Clip. Repeat the same process for the robot’s legs. 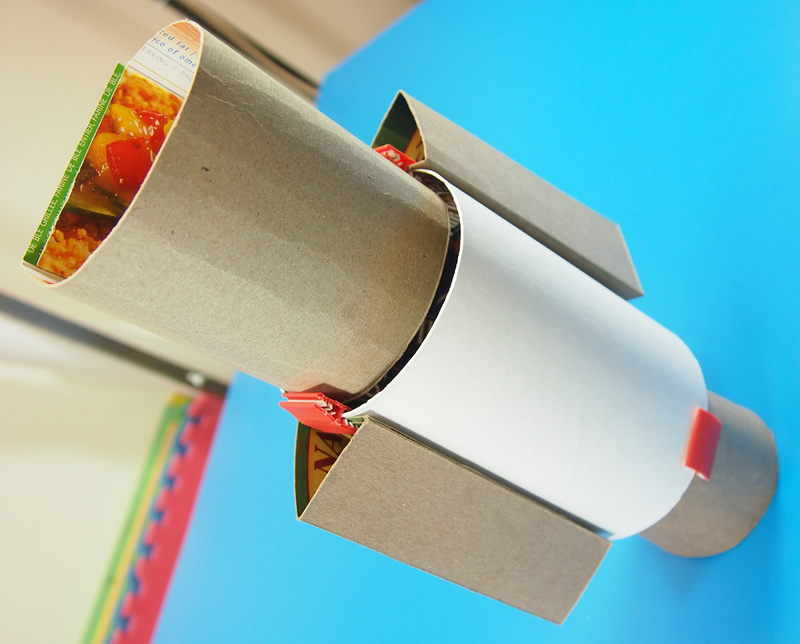 Use a smaller box so that it fits underneath the body like an exhaust pipe. Secure the exhaust pipe cylinder with another Constructa Clip. 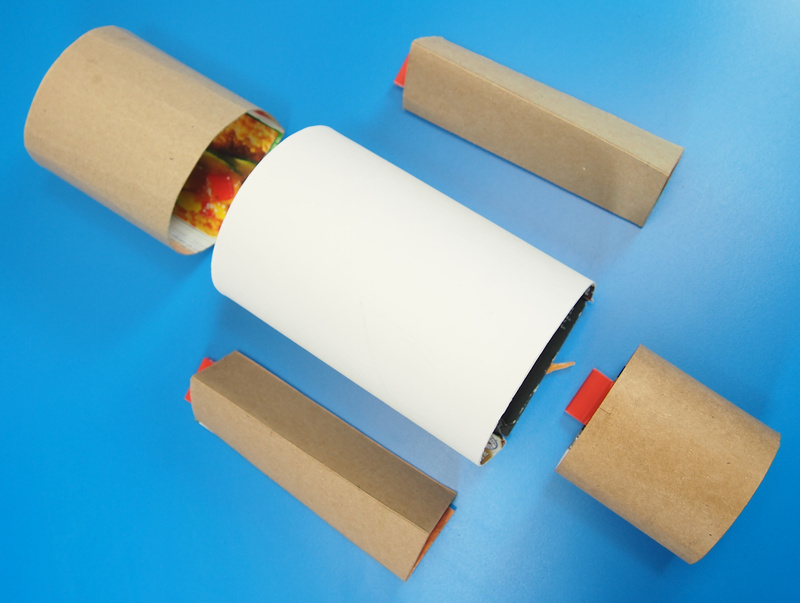 Make a second box similar to the size of the exhaust pipe cylinder to make the robot’s head. 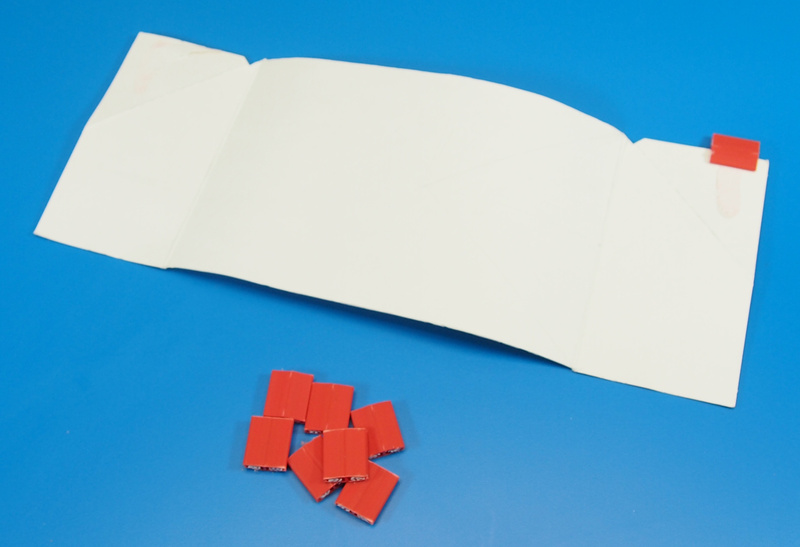 To make the arms, cut out two smaller rectangles and fold them into four sections. Fold each section into a triangular prism and overlap the final section to secure it. Slide a Constructa Clip onto the top edge to finish each arm. Align all the pieces together to see where they go. 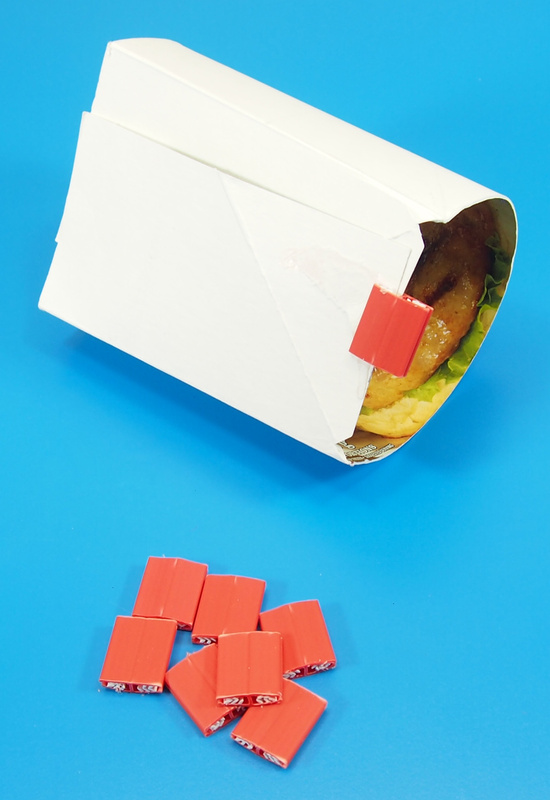 Use the opposite side of the Constructa Clip to connect each piece to their appropriate locations. Here’s a look at the robot all assembled without any decorations. Now it’s time to add some character to your robot! 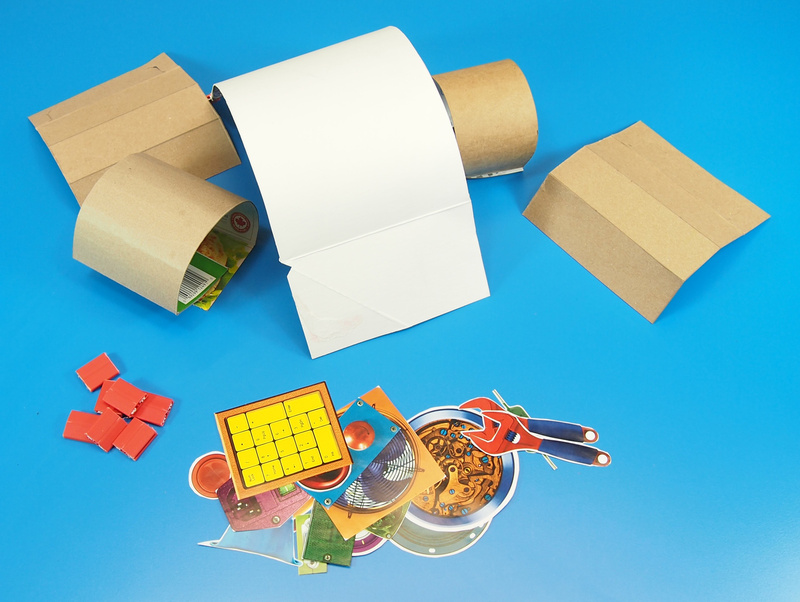 Cut out each of the Gizmo Paper pieces that you wish to add to your Gizmo Paper robot. Each of the pieces are similar to basic shapes such as circles, squares and cylinders, so students can exercise their knowledge of geometric shapes while exercising their scissor skills! Here’s the finished look of our robot! Now what do all those buttons do? 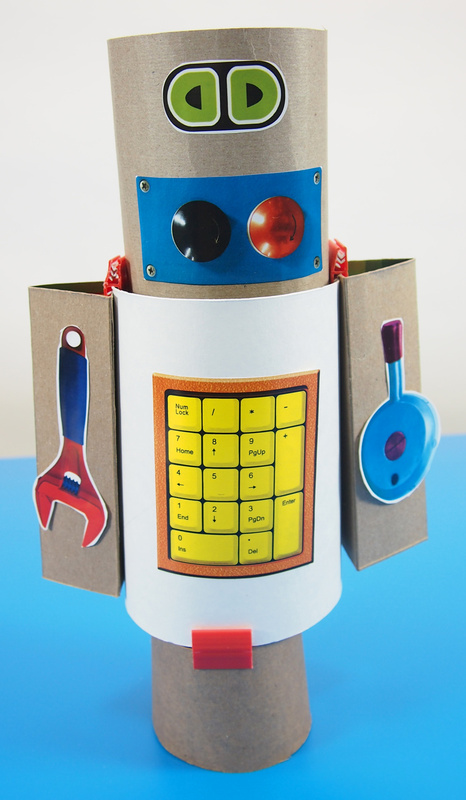 There are plenty of different combinations of robots you can make using a bit of recyclable card or boxboard materials, Gizmo Paper and Constructa Clips! Send us some of your ingenious robot projects! Ask your students what are the functions of each button on their robot? 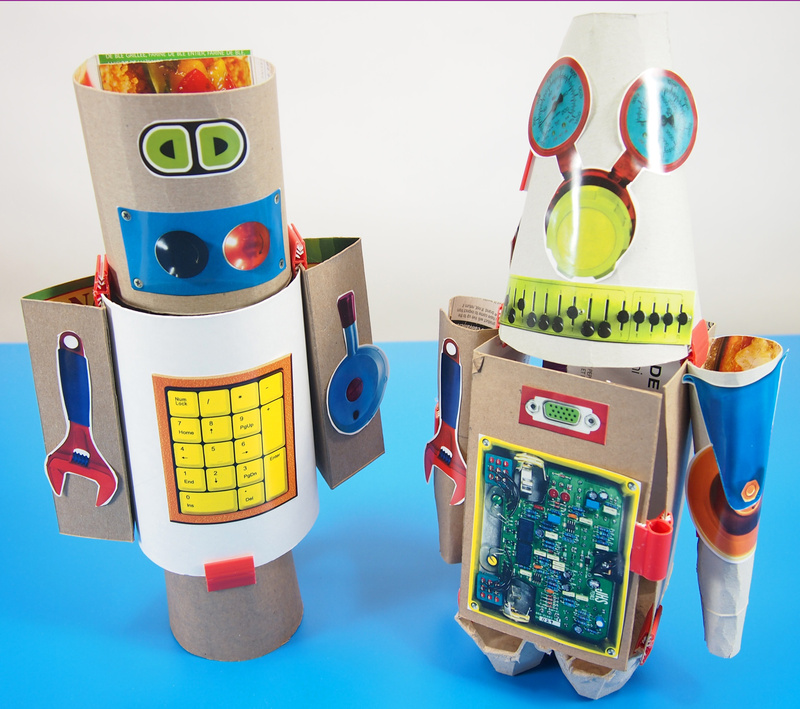 This entry was posted in Crafts, New, Science and tagged engineering activities for kids, gears, gizmo paper, gizmos, mix and match robots, national robotics week, paper robots, recyclable robots, recycled, robot activities for kids, robot crafts, robots kids by roylcoblog. Bookmark the permalink.